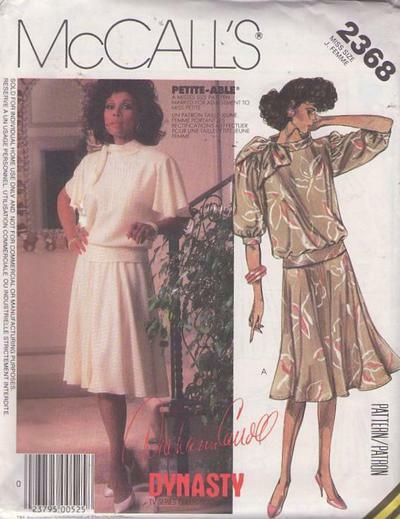 Bust 32.5", Waist 25", Hips 34.5"
1986, 80s Dynasty, Retro Career Clothing Patterns - MISSES TWO PIECE DRESS: Dress A or B has blouson top with bias tie collar, shoulder pads, buttoned back and lower band. Top A has elbow length sleeve with bands and gathered caps. Top B has short, flared bias cut sleeves. Flared skirt A or B is cut bias, has back zipper and waistband.